...my MOM! Oh my! I've noticed other little pieces of my mom surface in my behavior over the years but just this morning after looking through my pictures it dawned on me that these two food photos say it all. My mom was the queen of dessert concoctions. When I was young, I cannot remember a meal without dessert. It was the moment we all waited for and as children, our motivation for eating the main meal. Mom baked quite a bit and we often had her goodies for dessert but when that ran out she would just gather a few ingredients, throw them in a pretty parfait glass and say, "here's dessert!" Usually it consisted of some sort of fruit and whipped cream, or a few leftover chocolate chips, pudding, and who knows what else. All I can remember was that we always ate and enjoyed our dessert. Sometimes we even made a game out of guessing what she had thrown together. So, as I'm looking through pictures this morning I see these two food combinations. Both were things I had simply thrown together as a means of pleasing my three children...hmmm am I really destined to be my mom?!!?? 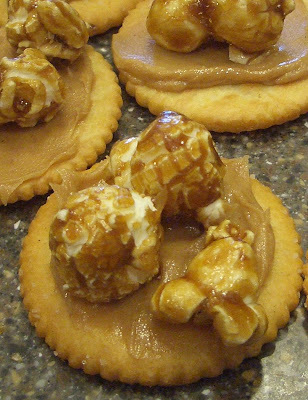 Ritz crackers with peanut butter topped with good old cracker jacks! Marshmallows melted in the microwave for 10 seconds then topped with pretzels. turning into your mom is not such a bad thing (not that you said it was bad)....you could turn into much much worse. those desserts look yummy, the bottom one especially. i will have to try the marshmallows with pretzels sometime.....wink wink. YOU sure are creative.